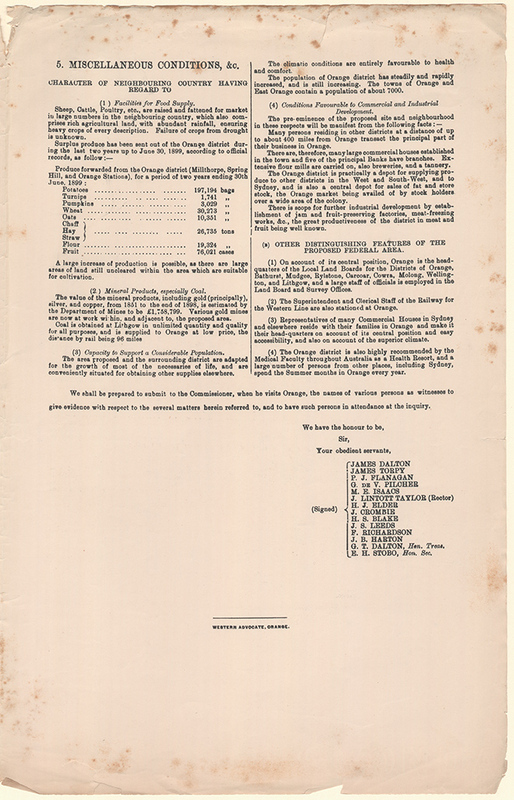 This record series that sheds light on the efforts of a number of towns, villages and other areas that proudly presented their submissions to become the capital of the new Commonwealth. 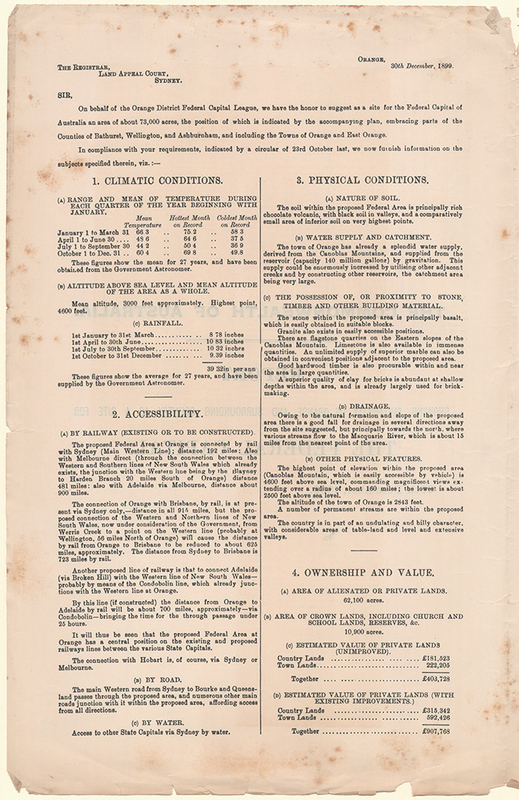 With the advent of Federation in 1901 the first Commonwealth Parliament sought to establish a federal capital within the state of New South Wales. The New South Wales Government had set up a Royal Commission in 1899 to investigate possible sites. The successful site would be situated at least one hundred miles from Sydney and would satisfy the list of criteria (see images below) published by the Registrar of the Land Appeal Court in an official circular sent to intending applicants. The Commissioner, Alexander Oliver, in a later review of the process set out the criteria in much more detail. 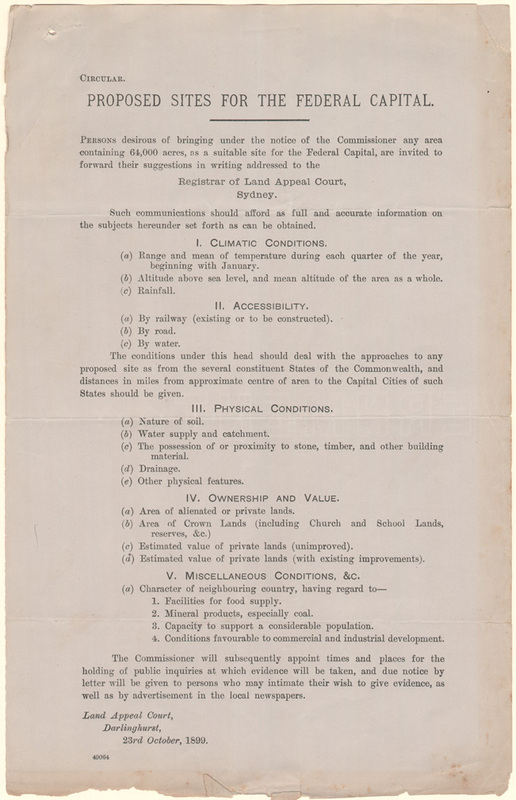 Both documents identify the perceived building blocks of a flourishing city at the turn of the 20th Century and the desirable standards in terms of health, transport, food production, supply of natural resources and self-sufficiency. 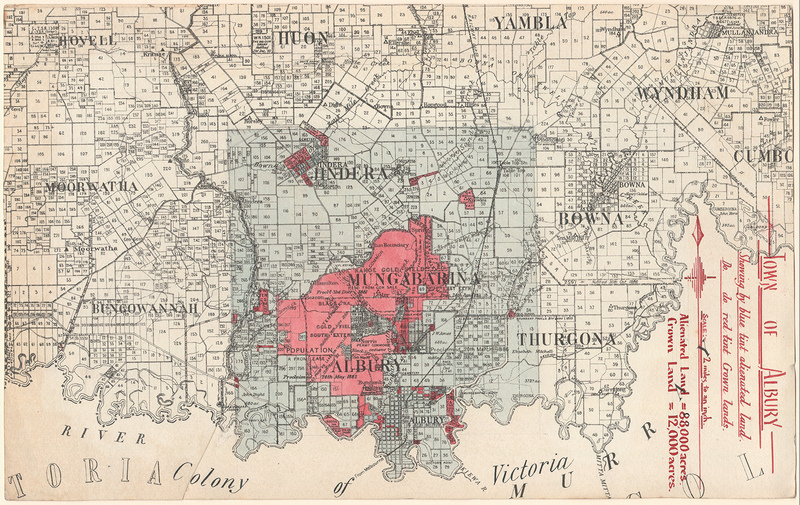 Forty towns vied for the honour of being named Australia’s capital city . 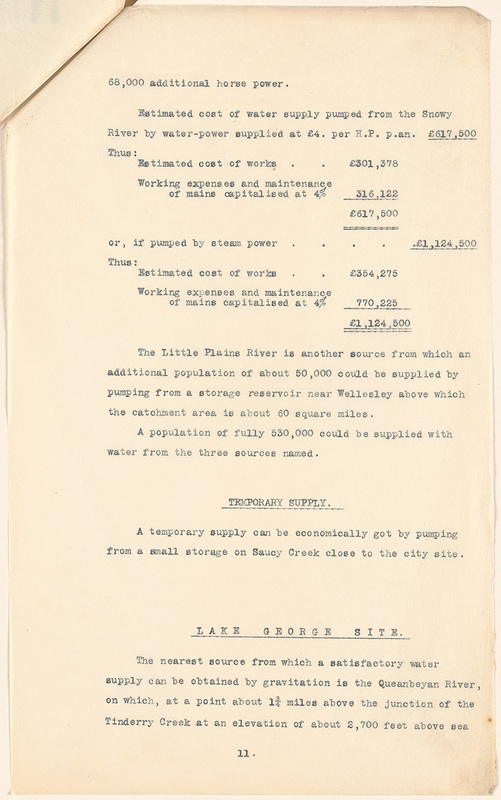 We hold these submissions as part of the records of the Royal Commission on sites for the Seat of Government of the Commonwealth. The submissions contain personal statements from prominent citizens addressing the selection criteria, maps of the proposed site and statistical tables relating to climate, water supply, food production and mineral resources. The level of detail and production standards of the submissions varies dramatically according to the resources available. 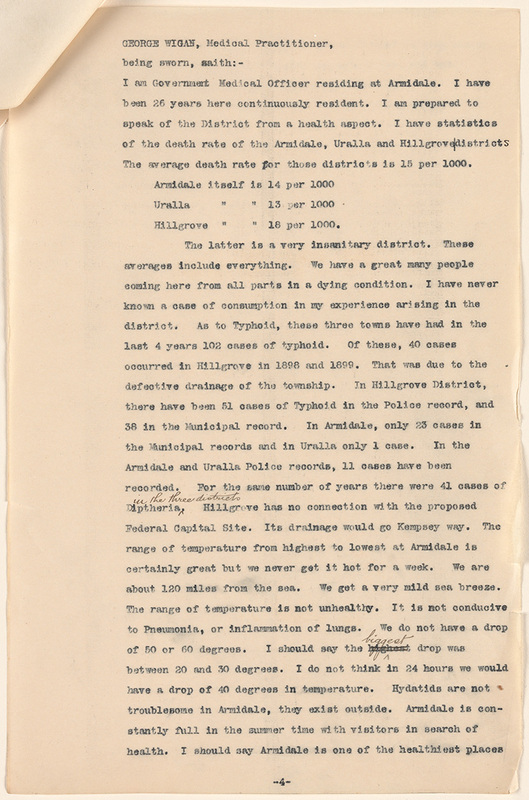 Temperature readings and climate statistics may be the work of the Government Astronomer of New South Wales or the local postmaster. Maps showing areas of crown and alienated lands may be hand drawn or professionally drafted on a grand scale. The submissions vary in length from four to two hundred odd pages. Many also include cuttings from local newspaper campaigns. What unites them all is their sense of identity and commitment. 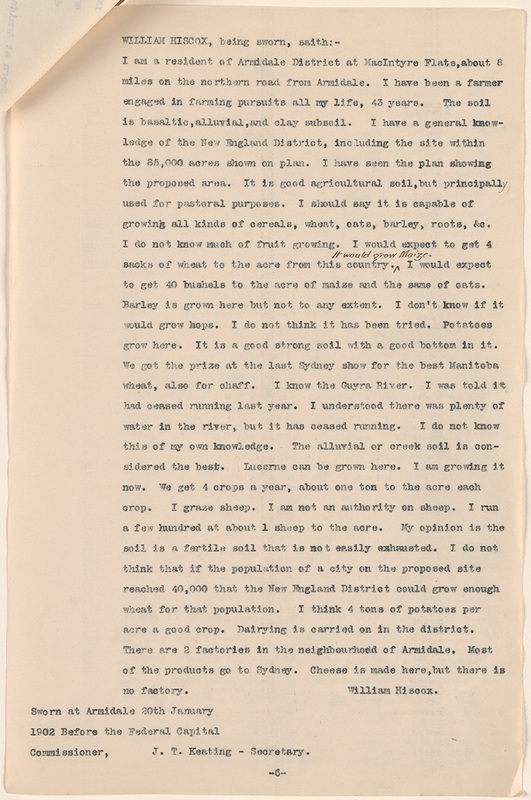 The village of Barbers Creek provides a good example of a small, simply formatted submission that seemed to be solely in the hands of one man, Herbert J Rumsey, seed merchant. The personal touch of the application contrasts sharply with the more sophisticated offerings from large and established towns. 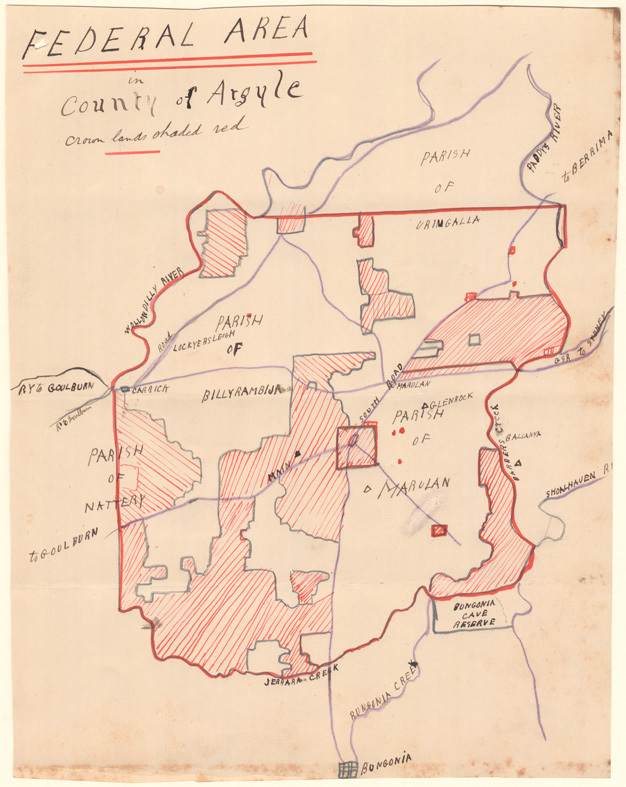 Rumsey’s handwritten application and hand drawn map of the area may be simple in style but clearly address the criteria. It is also a rarity in that Rumsey, officially the Hon. 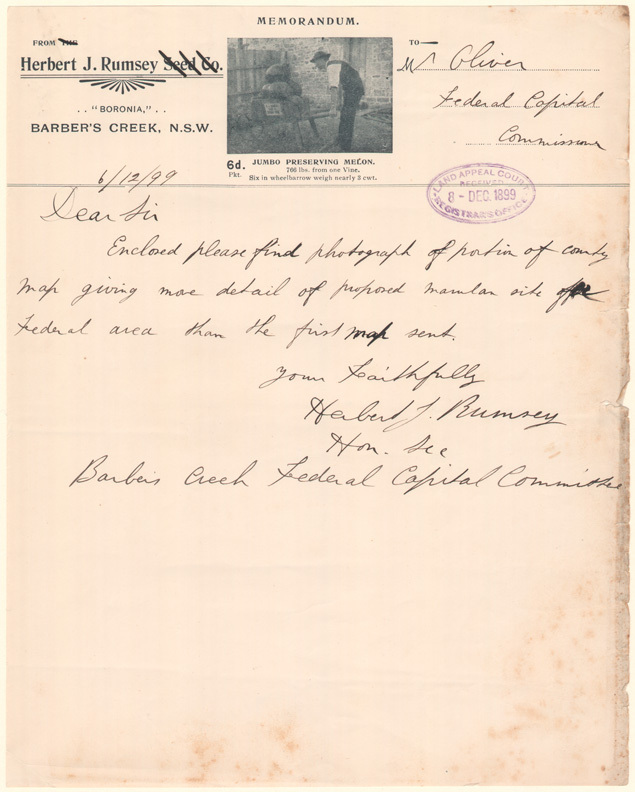 Secretary of the Barbers Creek Federal Capital Committee, does not appear to hold a recognisable position of authority or status. 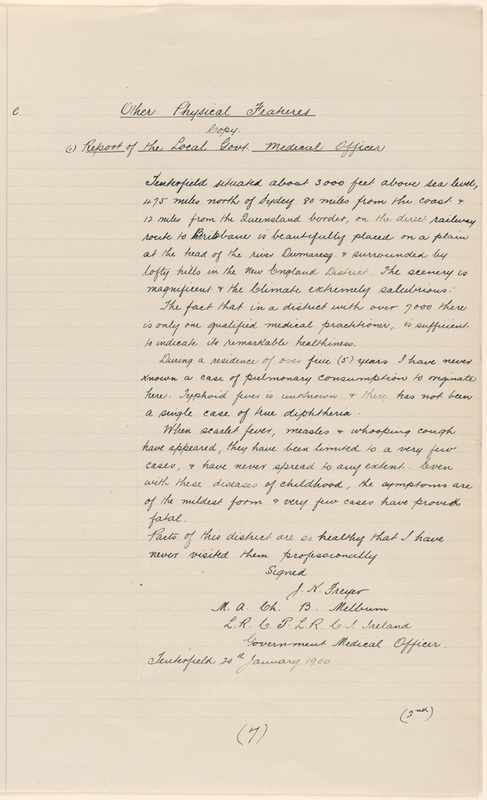 By far the majority of submissions have relied on statements from doctors, lord mayors, graziers, architects, solicitors, parliamentarians as well the government astronomers and surveyors. 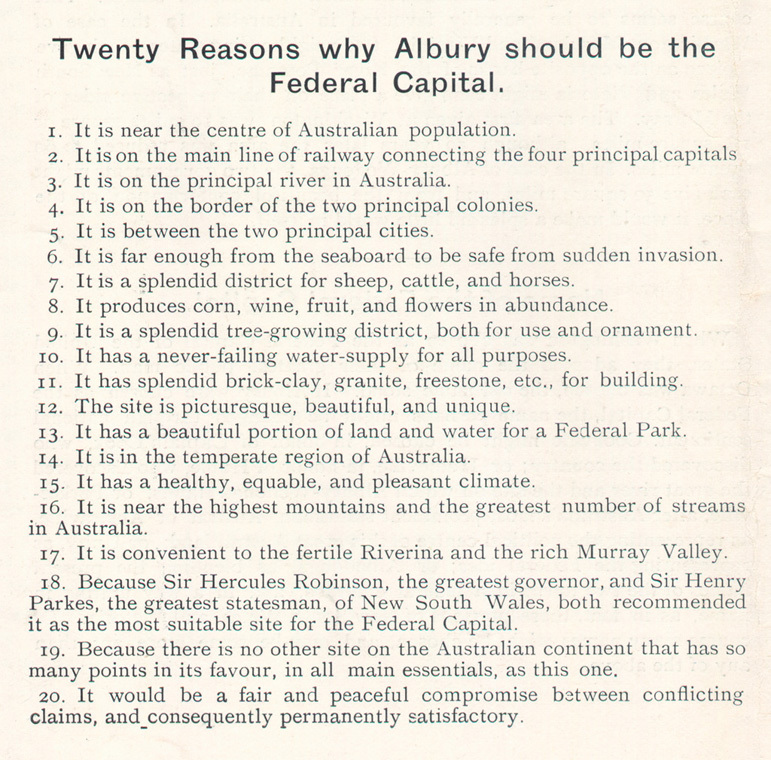 On the other end of the scale the town of Albury’s submission is the collective work of an impressive array of experts and even includes a glossy pictorial publication promoting the attractions of the area and a snappy summary of the main points in its favour. The town of Orange also submitted an impressive printed publication accompanied by a detailed hand coloured map of the proposed Federal site. 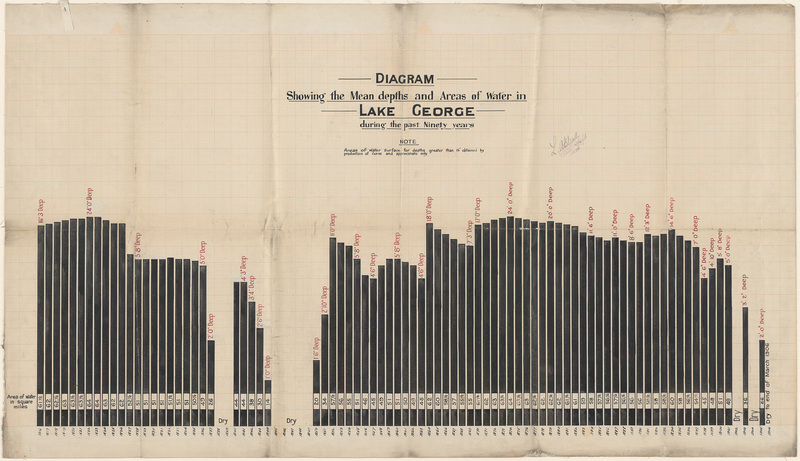 Of all the information submitted regarding climate, rainfall and water supply the absolute standout has to be the giant black and white hand drawn table of the Lake George water levels covering almost a century. 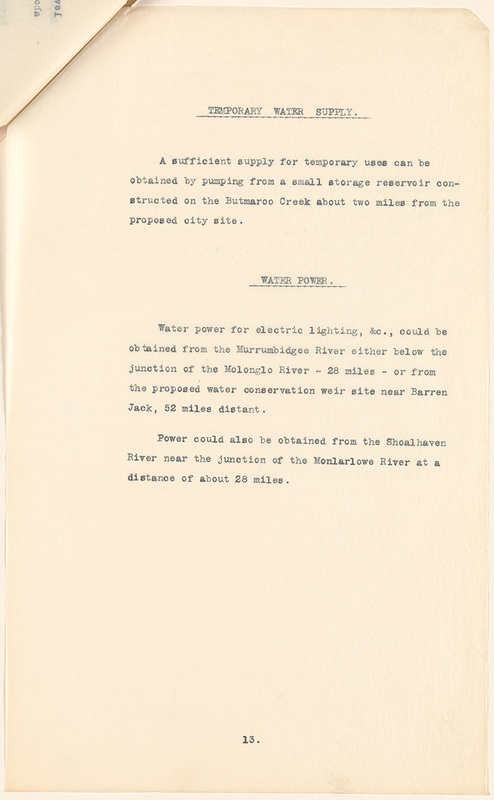 There is also a detailed report regarding the practicalities of water supply from this area that also highlights the complexity and importance of this particular issue. 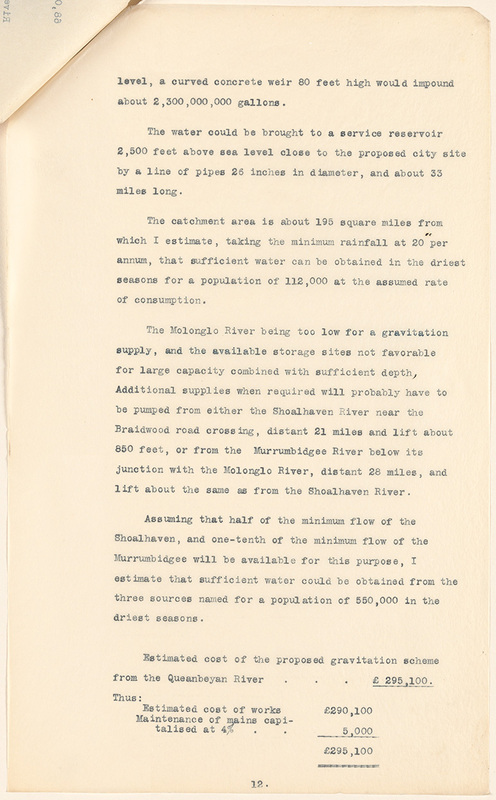 The site itself commands an extensive view of Lake George, which would undoubtedly possess much charm if the lake were full of water, but when your commissioners visited the spot it was dry, and presented anything but an attractive appearance. The site generally is wanting in picturesqueness. The statistical information in these applications will be of interest to anyone making a study of living standards outside of the major cities. It is however the glowing and often subjective testimonies from prominent local citizens that really bring the documents to life. 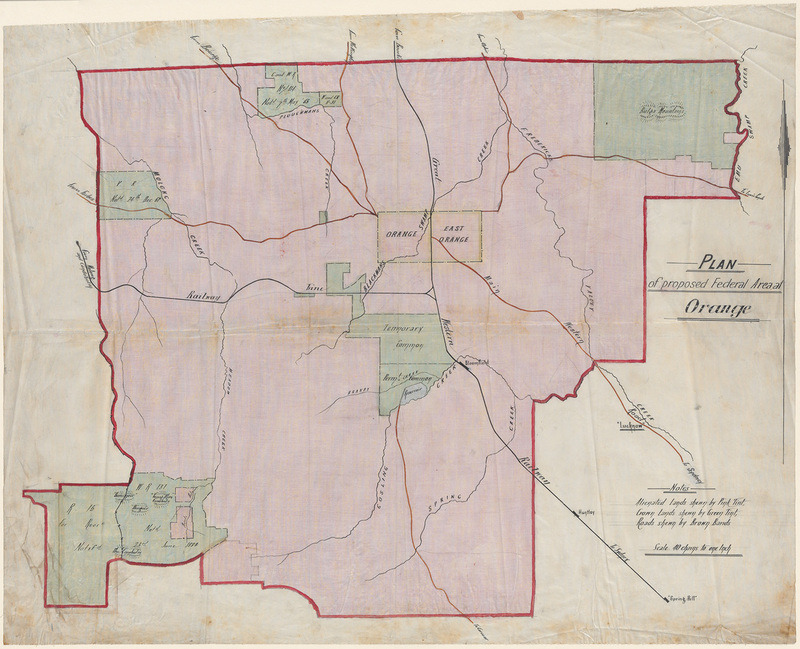 Whilst all of these submissions lost out to Canberra they are in effect a time capsule for rural New South Wales c.1900 and a valuable resource for social, local and family historians. On the broadest level they provide an insight into the prerequisites for the growth and sustenance of a successful city at the dawn of the 20th century. Many issues such as transport, health, climate, water and mineral supplies remain very high on today’s national agenda. At a local level they provide an interesting insight into each area, its prominent citizens, outstanding attributes, facilities and resources. 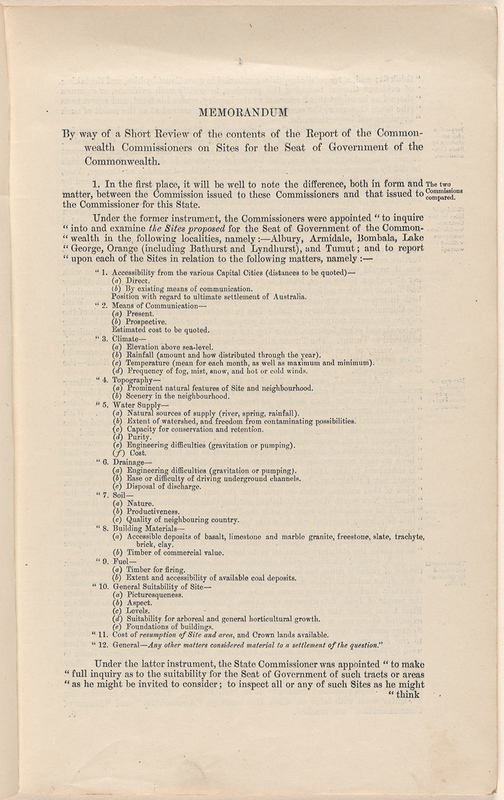 The Correspondence and Minutes of Evidence and proceedings of the Royal Commission on Sites for the Seat of Government of the Commonwealth 1899-1902, NRS 1460, 1461, [2/882-885.5]. A full listing of the forty towns that submitted applications can be found in Part 3 of our Guide to Federation.